Last week, I spent a week in Louisville, Kentucky as part of the VEX IQ International Robotics Finals, which was a very exciting seven days indeed! We had a spare day in the city before the competition, so we decided to visit the Kentucky Science Center and the Louisville Slugger Museum, where the famous baseball bats are manufactured. There was lots to see and do inside the museum, and we starting by walking upstairs into an exhibition on the human body. This was a large room, full with information about the different functions of organs and organ systems. There were displays about the digestive, respiratory and circulation systems, and we enjoyed finding out our heart rate by holding on to a bar. There were lots of interactive exhibits, such as one where we had to team up with each other and press buttons to destroy viruses, and another where we had to mimic the human heartbeat. I knew most of the facts in the room but I am sure that my brother Robert wouldn’t, and would have learnt a lot. Sadly, many of the exhibits were out of order and some were quite old. Standing inside a bubble, building a bridge and finding out about muscles! Before we left, we decided to watch the 3D Film “Journey To Space” in the museum’s cinema. The film was around 45 minutes long and was fascinating, talking about life in space and the challenges of reaching Mars. Although I am not a major fan of space exploration, the film was certainly interesting, and allowed me to think about the engineering challenges that a trip to space presents. The rest of the museum was aimed at younger children, so it was nice to have something aimed at the older members of the family. After a pizza lunch just opposite the Science Center, it was a short two minute walk to the Louisville Slugger Museum, where the famous Louisville Baseball Bats are made. It was dangerously close to closing time so we had no chance to walk around the museum, but we had a walking tour around the factory instead. None of us knew anything about baseball, but our tour guide was wonderfully useful at answering any questions we had. We walked through the factory, stopped at certain machines and watched videos. We were told that the factory produces 1.8 million baseball bats a year, and that they first arrive at the factory as billets (cylinders) of wood. When the factory was started, every bat was hand carved – taking up to half an hour to shape each one! Nowadays, there are machines which have countless of bat models saved, and each one can be made in 30 seconds. It only takes a click of a button to switch designs! We got to see bats being dipped to get distinctive colours, and were shown how each bat gets the Louisville Slugger logo pressed onto it. My highlight of the tour was being given full-sized bats to hold, which was enthralling. At the end of the tour, we were given an opportunity to ask questions, and were all given a free mini bat to take home with us. The tour was quite short at only 30 minutes long, but our guide was really friendly and knowledgeable so we learnt a lot and had a great time. Overall, we had a really exciting day visiting the Kentucky Science Center and the Louisville Slugger Museum. Our highlight of the day was definitely going on the walking tour of the Slugger Museum factory, and we wish that we had more time to visit the rest of the museum and go to the batting cages. I thought that the Science Center was quite old and not advanced enough, but I’m sure that younger children would really enjoy playing with the exhibits. Despite the fab museums we visited in Louisville, my favourite part of the trip was eating at all the American chains, such as Applebee’s; the portion sizes were gigantic! To see the exhibits and the movie at the Science Center, adults are $20.00 and children (aged 2-12) are $15.00. Full pricing information can be found here. To visit the Louisville Slugger Museum, adults are $12.00, seniors (aged 60+) are $11, kids (aged 6-12) are $7.00 and kids five and under are free. We are so happy to have been shortlisted for the Bibs (Brilliance in Blogging Awards) for 2015, but we really need your help to get through to the final 5. 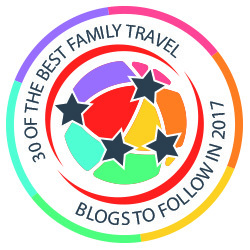 Please could you visit this link and then scroll down to travel and then us (Family Travel Times)? We’d be so grateful. You don’t have to vote in all categories, though there are lots of great blogs in there! I’m always a bit shocked at firearms in the states. In the Uk such a sign would be unthinkable wouldn’t it. These look like really interesting places to visit though and I don’t think I’ve ever seen so many baseball bats together. Wow! What a great and interesting trip. I do find that sign rather unnerving and a reminder of just how different a place the US is. We really were surprised by the sign, as guns are rarely used in the UK. We had such a great day, and learnt a lot. We really had a great day. I loved seeing the baseball bats being produced, and really enjoyed the 3D film! I would love to visit Kentucky – a shame the displays weren’t well looked after in the museum but great that it was so interesting. The baseball museum also looks fascinating. It does look a fascinating trip, but that sign would most definitely have worried me too. Kentucky certainly isn’t the first thing that “holiday destination” springs to mind, but I know that my friends and I had a fab time! Wow to that giant baseball bat, it’s HUGE! It was a really good museum 🙂 The baseball bat is actually the largest bat in the entire world and it was massive! It sounds like you had a fantastic day. I think my son would love some of the things you mentioned in the science museum and I am pretty sure I would have to drag him away from that giant baseball bat as he would be pretty amazed lol! We really did have loads of fun. The science museum had lots to do and we all had a great day! I get jumpy when we visit the US about firearms and guns. It is something that really bothers me a lot. I would love to visit the baseball bat museum! We were really shocked – it is unimaginable to think of that happening in Britain! Kentucky is on my list of places in the states to visit. This sounds like such an amazing experience! My boys would have loved it as they love anything space related! It looks like a very interesting museum to visit although I agree that the sign is very alarming! Thank you! 😉 We were all alarmed, but still had a fab day. I’ve seen on TV how they make baseball bats. Pretty interesting! It was fascinating, and I was amazed by how advanced the machines were. That’s one huge baseball bat! Looks very interesting to see how all those bats are made. I learnt a lot, and was surprised how many bats were made each year! Sounds like you had a great day out, I’d definitely look them up if I was heading there! That signs seems so bizzare to me. Thought it was some kind of a joke at first but then remembered what country you are in. Sounds a fun museum to explore though. Sounds like a fun – and different! – day out! The first time I visited Kentucky I saw a similar sign on an office door of the company I was going to interview with and was shocked. Not something we see in the Northeast US either. I love exploring Science Museums and the baseball bat museum sounds cool too. We had a brilliant day and a fantastic holiday, but I was definitely on edge whenever we walked around. Our family tries to go to a science museum whenever there is one where we travel. We have seen some great ones, and some small ones, but still entertaining. Looks like you had a fun trip! Can’t wait to go to Louisville! I’ve not spent a lot of time in Louisville, but that giant bat is hard to miss! They’re is also a giant bat down the street- they flying, nocturnal type that hangs from the side of a costume store. It’s certainly eye-catching as well. Loved the article. And, welcome gun insane America. Sorry you had to see that.